Home→Feeding Dogs→Feeding On Demand for a Weimaraner? Feeding On Demand for a Weimaraner? Feeding on demand is the opposite of a dog feeding schedule. If you think that you might like this method of feeding for your Weimaraner, there are a couple of things that you should consider. Free feeding or demand feeding is definitely easier for the caretaker. It is used by kennels, breeders and people who can’t be home during the day to give their dogs a second meal. Here’s how it works: You simply fill a dish or feed hopper and keep it filled, so that your dog can help himself when he feels like eating. That’s for dry food. If you use moist or canned food, you need to use less and add to the bowl more frequently, as it will have a tendency to dry out or get spoiled. Feeding on demand is the simplest method of feeding your dog. It eliminates having a dog feeding schedule. If your dog paces himself by eating small amounts more frequently during the day, he will have a more constant level of nutrients and blood sugar in his bloodstream. This method of dog feeding can eliminate coprophagy—the nasty habit of eating feces. If you have more than one dog, this free feeding allows the more passive dog to get its share, after everyone else has eaten. I have to say…That all sounds pretty good. However, there are some disadvantages to consider when you are thinking about self-feeding. Especially if you have a Weimaraner or other large breed dog. Without supervision, some dogs eat too fast. Weimaraners and other large chested dogs are prone to dog bloat, a serious condition that can be fatal. Left alone to eat, they can eat too fast and develop bloat. Dogs don’t necessarily stop eating when they have had enough. Many will just keep eating. If your dog is bored or doesn’t get enough exercise, he may eat too much and gain too much weight. Dogs who are self-feeding can easily become obese. The feeding process becomes impersonal when you use self-feeding with your dog. You both miss out on the bonding and fun and excitement of mealtime. 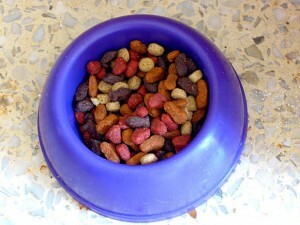 There is another alternative to consider, if you are unable to keep a strict dog feeding schedule. Automatic dog feeders can be programmed to release food on a schedule that you set. And you can decide on how much should be released, usually from ¼ cup to 3 cups at a time. While they are definitely not as personal as feeding your Weim, some automatic pet feeders allow you to record your own voice, so that the machine can tell your dog when his meal is ready. An automatic feeder that releases ¼ cup at a time could help you prevent dog bloat in your Weimaraner dog by feeding her small portions at a time. Bloat is a common health problem for Weimaraners. If eating fast is a problem with your Weim, make sure you supervise her until she gets used to eating with her automatic feeder. Of course spending time with your dog and feeding her, is the most rewarding for both you and your Weim. However, if you can’t be home at meal time, these options can help you feed your dog when she is hungry. 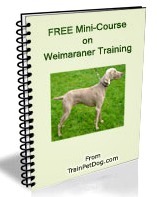 Learn more about Weimaraner care and training in a free mini-course here.